When people move, they often throw out food, rather than transport it to their new location. 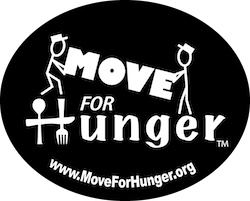 Move For Hunger and the relocation companies that partner with them throughout the Northeast help deliver this food to families in need, rather than add it to landfills. The service is free to customers. At the heart of the mission is the fact that 1 in 5 children in America do not get enough to eat; that’s 17 million hungry children, a number that both Arnoff and Move for Hunger are dedicated to reducing. Locally, the crews of Arnoff Moving & Storage will collect food items from their customers during their move and deliver it directly to two local food banks - The Food Pantries for the Capital District and Dutchess Outreach in Poughkeepsie, NY. Since 1924, Arnoff Moving & Storage has been a family-owned and operated full-service moving and storage company serving New York's Hudson Valley, Massachusetts, Connecticut and Florida - as well as many other states across the country. With the fifth generation now involved with the company, Arnoff is truly the family to trust for all your relocation needs. We are proud to say, "Let Our Family Move Your Family."